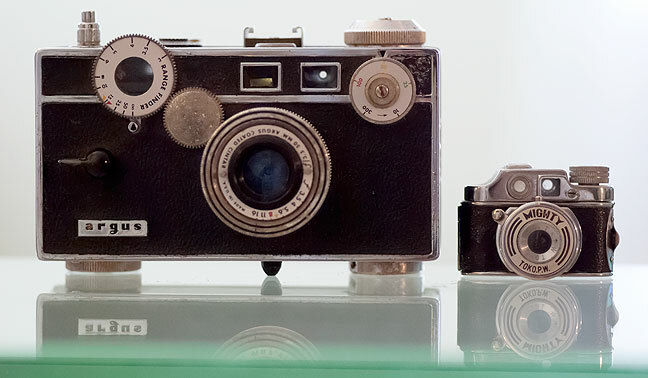 An Argus C3 camera, popular in the 1940s, 1950s, and 1960s, sits next to a quintessentially compact camera, the Toko P.W. Mighty. 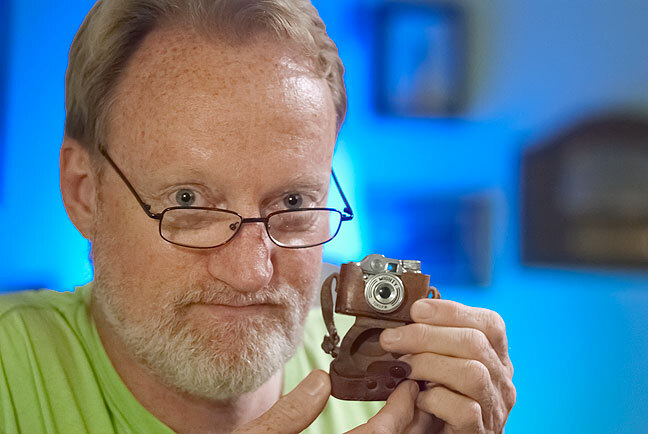 “Compact” is a key buzzword in photography. Whether someone is bragging on a camera or recommending one, if they can, they’ll add, “and it’s very compact,” since photographic equipment can range from the size of a cell phone to the size of a steamer trunk. Abby made this image of me holding the Toko P.W. Mighty last night. Touted as a “spy camera,” it was really more of a novelty. Compact cameras are not new. During the peak of film camera dominance, Olympus was the king of the compact hill, with SLRs like the OM-1 and the XA. In 2014, the battle for balance between size and quality is still at a fevered pitch, with smart phones beginning to dominate the compact camera market (in fact, most compact digital cameras are disappearing as a result), while the digital SLR is being challenged by the awkwardly-named “mirrorless” class of cameras. I thought about this last night when my wife Abby and I were playing around with some antique cameras she brought back to me from her recent trip to see her daughter in Baltimore. They included an 8mm movie camera, a folding-bellows medium format camera, a Kodak Brownie, an Argus C3, and, most intriguingly, a Toko P.W. Mighty “spy camera.” The Toko is quite tiny, and was made in occupied Japan just after World War II. It took 17.5mm film, which I’m sure I’ve never seen, much less shot. It was neat that Abby recognized how interesting this little camera is. The shutter runs and the controls work. It’s a fun little piece of history for our collection. 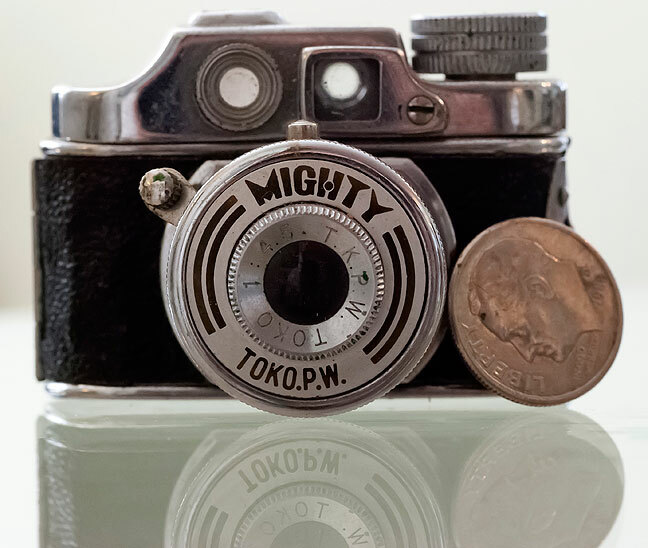 The Toko P. W. Mighty camera poses with a dime for scale.